Dunno if this has been discussed here or not, did a quick search and didn't find anything. Mazmart is now making an upgraded water pump for the RX-8 and FD. Basically it's the same externally as the stock water pump, so it bolts right up like stock. But, the impeller blade is CNC machined to be FAR more effective at moving water. Benefits are it moves more coolant, will supposedly cool the engine better, will definitely not cavitate at high RPM, and requires less power to do so, freeing up some wheel horsepower. I've been digging through the WAAAAY too long thread on the RX-8 forum about the pump, and I think I've got it figured out. Pump is $235, which is pretty damn reasonable, IMHO. To order, they don't have it on their website yet. Call 800-221-5156 to order one. Also comes with a new water pump gasket, which is good. And, no, I have no relation to them, I'm just passing on new parts goodness . OK, the horsepower increase. One dude guinea-pigged it for them. 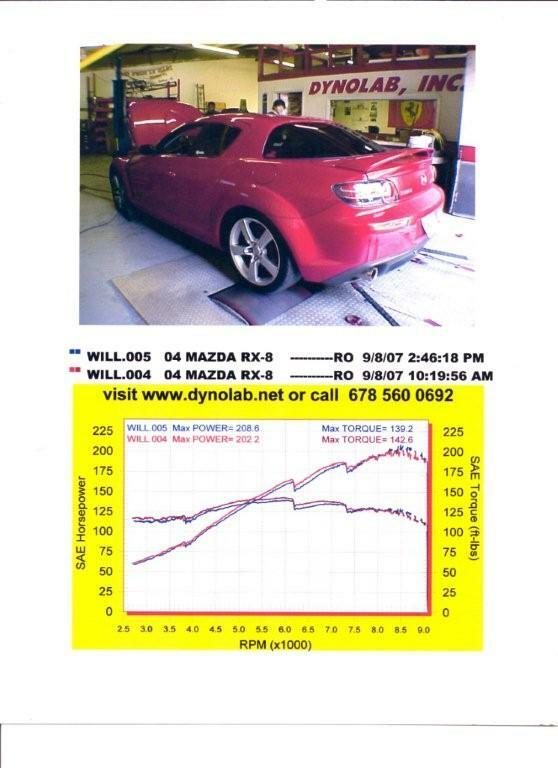 Dynoed at 202 wheel horsepower, drove to the shop, changed JUST the water pump (didn't disconnect the battery or anything), drove back to the dyno, put down 208 hp. Looking at the dyno graph, it's power across the board as well. This makes sense, considering the FD and RX-8 water pumps use similar flat blade impellers. This offers a lot of resistance, and that robs power. Attached are pics of the dyno chart and the new water pump impeller. I might have to pick one of these dudes up . Also, the *22* page RX-8 club thread. LOTS of noise and garbage in there to sort through . 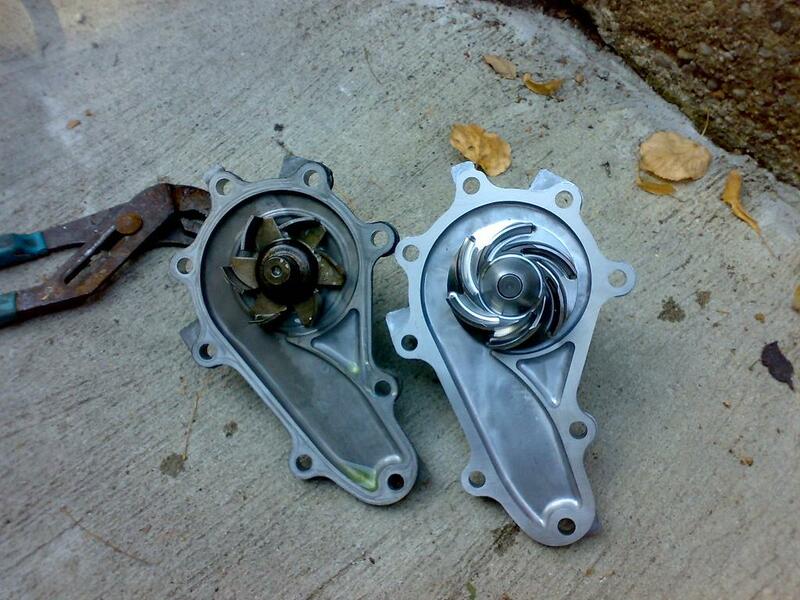 Another pic - comparison of stock RX-8 water pump to Mazmart's water pump. The product looks nice, and I don't doubt the dyno graph. However, did you ever see any testing data as to actual flow rates in the overly-long thread? Will this water pump work on a TII? would having higher flow rate put more pressure on the coolant seals?? I wouldn't think so if you still had the same pressure cap. That is pretty damn cool, I might have to consider picking one of these up in the next few months. Thanks for the good news Dale! ok whos going to be the test subject? Yes - another day and you discover that the existence of yet another 'upgraded' part that you didn't realize was essential. I'm having a hard time believing the 6 whp claim, though. Have people that switched to electric water pumps reported anything like this number? It does look good, but I would like to see some flow tests/documentation. Cavitation is not air bubbles. Cavitation is tiny water vapor bubbles. They collapse back to liquid almost immediately. I'm not sure how you can determine for sure whether cavitation is present or not. The OEM 13B REW water pump impeller is one of the worst in the automotive world. They have square ends, square blades, open center etc. You can modify the blades somewhat to help but it still isn't anything great. The 13B RE and T2 have an amazing water pump impeller that REALLY flows without cavitation.... Only problem is they aren't interchangeable with the rew because they flow in the opposite direction. I'm very very glad to see a company after 16 years finally make a REAL water pump for the REW!! The pump looks really nice, congrats to them and thank you Dale for sharing this info with us! If the flow rate progression slows considerably and even drops after extended high rpm, the pump is probably cavitating. 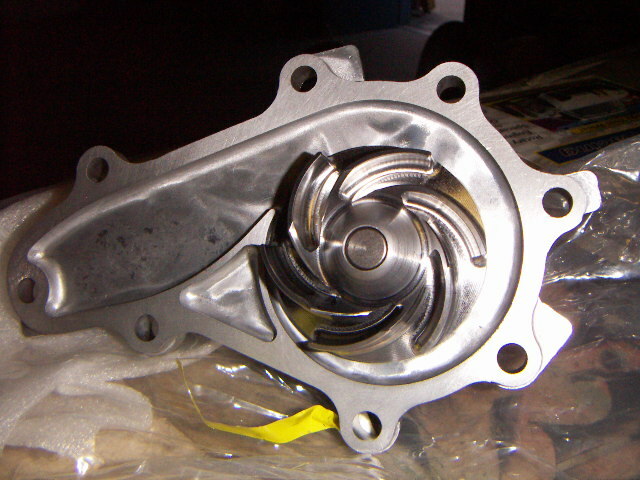 Cavitation drastically reduces the impeller's ability to move the coolant through the system. I'd still like to see some flow rate comparison test results on this before plunking down hard-earned cash. No disrespect meant to Dale or the makers of this product, but there's a lot more that goes into water pump design than just nice looks and a dyno graph. If I look at the dyno graph carefully, the two curves cross over, and the blue (later) curve is higher only at the top (peak HP) and lower every where else. Assuming that the MazMart pump is the blue curve, that says to me that the MazMart pump is costing HP until it cavitates (less pumping, so less HP used) at the top end. BTW, in general, more flow uses more HP to pump that additional flow, so this makes sense to me. The only way you can get less HP consumed by a centrifugal pump is to pump less volume. For reference, when you use a vacuum cleaner, the motor/blower speed increases when you block the air flow. Same principle. I would also like to see flow data for this new pump vs. the stocker. It is interesting how different the designs are.